Women in Aviation: What Gives? Home » Blog » Women in Aviation: What Gives? Posted February 13th, 2015 by Russell Kornblith in Gender Discrimination and Harassment. Getting my pilot’s license was one of the greatest experiences of my life. There’s nothing like the thrill of your first solo flight or nailing the landing in a tough cross wind. Yet aviation remains a male-dominated hobby, and, more importantly, a male-dominated career. And it’s been that way for some time. Why? My flight school, located just outside of Memphis, TN, had three female flight instructors—just under half the staff. All were accomplished pilots and great instructors. My primary instructor was an Air Force veteran who was serving in the Tennessee Air National Guard. During my training, she flew numerous missions in and out of Afghanistan while also training airline transport pilots and private pilots like me on the side. But my school and my instructor were outliers. FAA statistics obtained by Women of Aviation Worldwide Week, indicate that in 2010, just 5.39% of pilots were women, and just 5.15% held licenses permitting them to fly for-hire. According to the International Society of Women Airline Pilots, of the 130,000 airline pilots worldwide, only 4,000 are women. Why the massive imbalance? I went looking for explanations. None of the conventional wisdom is particularly satisfying. One source suggested that women suffer from a confidence gap. But this explanation—if true—still would not explain why aviation suffers from particularly high gender segregation. 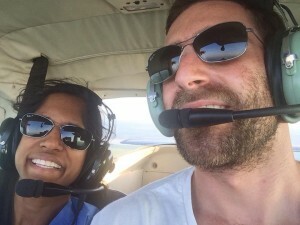 The same website also suggests that most certified flight instructors are men, and might, therefore have (more) trouble communicating with women. Although this explanation is not wholly implausible, it still doesn’t explain why aviation remains less integrated than, say, medicine, which was a traditionally male-dominated field, and also requires scientific and technical training. A second answer has to do with stereotypes of women and pilots. Hint: They’re not good. A note written by a passenger to a Canadian pilot exemplified the worst of these. “David” wrote to WestJet pilot Carey Smith Steacy saying, “the cockpit of airlier [sic] is no place for a woman.” To David, I say, enjoy the walk (and perhaps learn to write along the way). I’ll be with Captain Steacy. But consumer prejudice doesn’t really explain what’s going on. Most of us don’t pick our flights as “David” does. And although prejudice among pilots might once have been a good explanation, as Amy Laboda, editor in chief of Aviation for Women magazine told CNN, “The men who didn’t want women in the cockpit have mostly retired.” Indeed sisters and British Airways pilots Aoife and Cliodhna Duggan told the Guardian that most reactions to their gender come from passengers, not colleagues. A fourth and final explanation notes that until 1993, the military didn’t permit women to serve as combat pilots. This explanation might carry some weight, given that many airline pilots begin their careers in the military, but even before 1993, women could still serve pilots. And, as one Navy pilot told The New York Times before the ban was lifted, “[i]f they don’t, there’s not much of a career left for me. If I can’t fly, I’d leave the Navy.” All the more reason to fly in the private sector. Moreover, even if the military has contributed to the imbalance, the imbalance in the military doesn’t explain the gender imbalance of private pilots who fly for fun. In my day job as an attorney, I’ve represented the interests of women in non-traditional occupations. Indeed, I co-authored an amicus brief to the Supreme Court on the subject. Typically, the reasons for gender segregation are relatively simple, even though the problems are systemic. Here, I’m at a loss. Our work teaches us that discrimination is often subtle and that fear of retaliation or isolation can help to keep the real facts about discrimination hidden. Here, they certainly are. When he went to Zaire in 1975, Mohammed Ali marveled that the pilots were black. This was, he believed, a major symbol of success for the nations of Africa. When it comes to female pilots in America, let’s hope that we get there soon.